The earthy taste of the roasted beets is utterly delicious in this Roasted Golden Beet Salad with Creamy Goat Cheese. 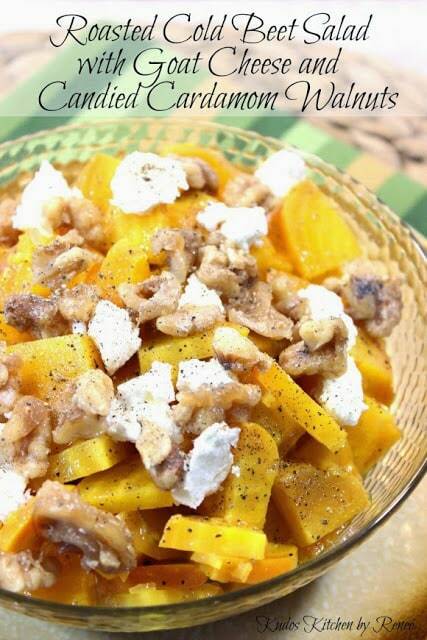 Candied cardamom walnuts top the salad for a flavor and crunch that will both surprise and delight your taste buds. Have a got a fantastic recipe for you today if you’re a fan of beets. 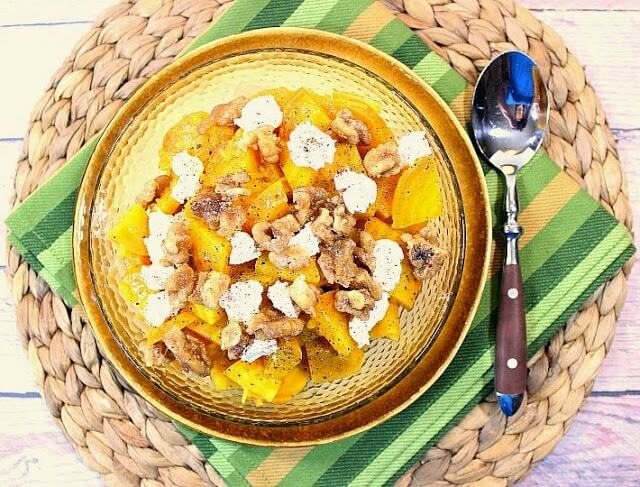 Red beets or golden beets, they’ll both work wonderfully well in this recipe for Roasted Golden Beet Salad with Creamy Goat Cheese and Candied Cardamom Walnuts! I know, right? The inspiration for this cold beet salad comes from a cookbook I’d purchased while we were on a recent trip to San Francisco. 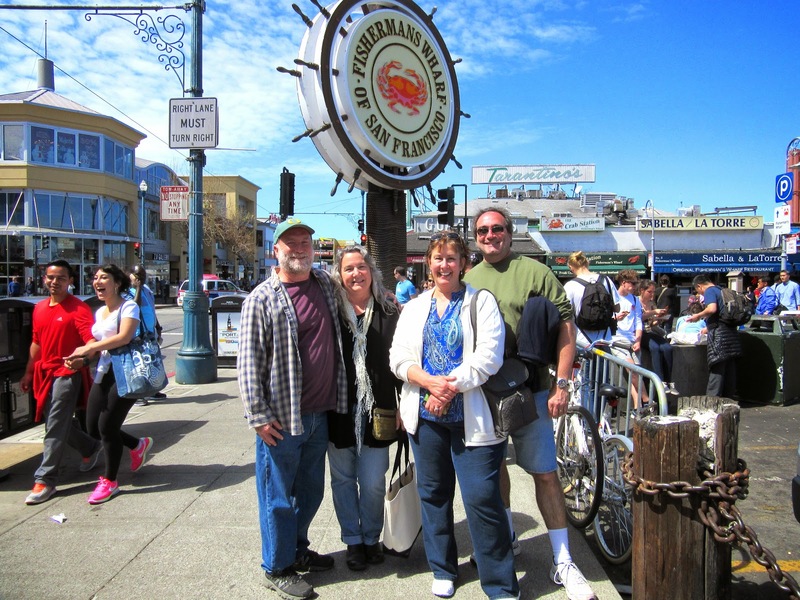 This was the first time I’d ever been to San Francisco, and I was super excited to visit the city, and, of course, the iconic Fisherman’s Wharf. Our time there was brief, but the beautiful vistas and delicious food made a huge impact on me, and now I’m anxious to plan our return trip. The cookbook I’d purchased while on our trip is called: “The San Francisco Ferry Plaza Farmers’ Market Cookbook,” and the recipe that I took my inspiration from can be found on pages 85 and 86. It’s called: Beets with Blue Cheese and Candied Walnuts. The changes I’ve made to the original recipe are these: I’ve used golden beets in place of red beets (I find they’re neater to work with). I’ve swapped out goat cheese for the blue cheese (my husband isn’t a big fan of blue cheese). And I’ve added cardamom to the candied walnuts, which is one of the best calls I’ve made in a long, long time. The taste of the candied cardamom walnuts alone will knock your socks off! So much so that I’m planning another recipe around those alone! Trust me when I tell you… they’re incredible!!! -Place the first 3 ingredients into a small saucepan over medium/low heat until the butter is melted and the sugar is dissolved. 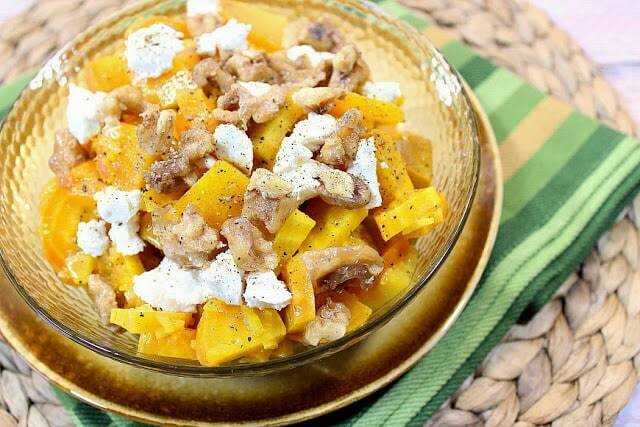 -Add the walnuts to a small bowl along with the salt. Pour the melted butter and sugar mixture over the walnuts and stir to combine. Spread the nuts out onto a baking sheet that has been lined with parchment paper. Sprinkle the nuts with the cardamom. -Bake in a preheated oven for 12-15 minutes. Remove from the oven and cool completely. Break the nuts into pieces and store in a ziptop bag in the frige or freezer until ready to use. -Trim the greens and root ends from the beets and discard those bits. Wash the beets well under running water. Wrap each trimmed beet in a piece of aluminum foil. Roast in a preheated oven until fork tender (approximately 45-50 minutes). *Note – You’ll have to unwrap the beets to test their doneness. -While the beets are roasting, place the shallot, vinegar, olive oil and Dijon into a small, lidded container, and shake well to combine. Set aside until ready to assemble the salad. -Remove and unwrap the cooked beets and allow them to cool until you’re able to handle them. Once cooled, use a paring knife (or your fingers) to remove the skins from the beets. Slice the roasted beets into ¼” slices and place them into a medium bowl. Pour the apple cider vinegar mixture over the beets and stir well to combine. Place the dressed beets into the fridge for a minumum of 4 hours. -When ready to serve, top the chilled beets with the crumbled goat cheese and the candied cardamom walnuts. Sprinkle with a pinch of black pepper and serve cold. Every year my husband plants a vegetable garden and harvest time is always something I look forward to. This year is the first year he’s planted beets. We couldn’t find the golden variety in our local home center, but next year I’ll order the seeds from one of the many gardening catalogs that arrive in the mail. I’m anxious to see how they’ll grow for us and can’t wait to use them again in this recipe. 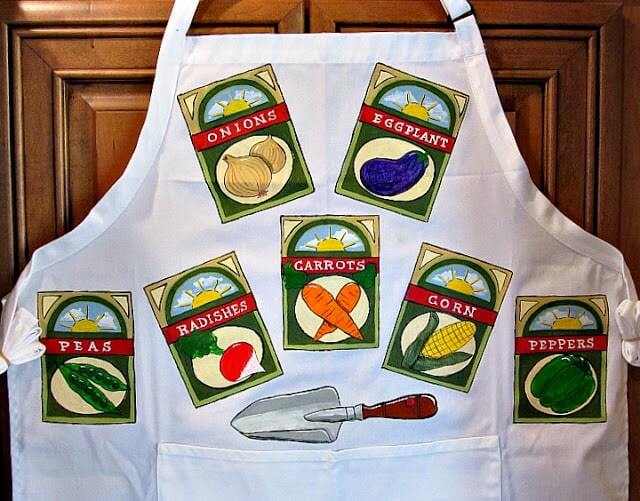 Speaking of seeds and gardening…This is one of my favorite apron designs. There are so many fun and tasty veggies that I had a hard time choosing which ones to paint on my seed packets. Now I wish I would have added beets. LOL Oh well,..next time for sure. If there is ever anything I can paint for you please visit my shop on etsy or feel free to contact me at anytime for a price quote. Thanks for visiting. I hope you’ll have a delicious day! I don't use goat cheese nearly as much as I think I should! After seeing this salad you've inspired me and I've never even tried golden beets but they look scrumptious! Bring on the beets! Love this cold salad. After looking at this recipe and the photos, I simply do not know why I am scared to try beets. I'm loving all the components in this. I urge you to try them again. They may be a little bit of an acquired taste but well worth the effort. I love golden beets…like, a lot! I love the thought of them with some creamy goat cheese and candied nuts (cardamom!!). Just added beets to my shopping list. I'm scared to try beets, too, like foody schmoody. I actually did try them once and had a terrible experience. Time to try again! I'm sorry that you once had a terrible experience with beets. If you ever decide to try them again, I urge you to use this recipe. Cold summery salads are just what we need right now! The weather here is so hot and humid that I'm dying for cold foods! We are huge beet fans in our house and I'm loving all of the different flavors you've combined in this dish! Especially the cardamom walnuts! It looks like you had a gorgeous time in SanFran…that photo is so cute of all of you. And this salad…can I tell you how much I love beets! Especially golden beets! A great summer salad recipe, Renee! What a lovely flavor combination. I like that you switched to gold beets, which I need to find…I'm new to enjoying beets…and red beets have gotten my counter and clothes on more than one occasion! Isn't Fisherman's Wharf wonderful? I could spend a few days just hanging out and eating there. What a lovely salad this is, with some great crunch and creamy goat cheese.